Napoleon Bonaparte, a love story. “It was the best of times, it was the worst of times...” is the epic phrase made famous by author Charles Dickens who used it to describe the time period of The French Revolution. In 1793 when the fictional character Sydney Carton of A Tale of Two Cities sacrifices himself on the guillotine for the love of his life, Napoleon Bonaparte age 24, had just begun to fulfill his legacy as a revolutionary. By 1795, in a maddening state of love, Napoleon had begun to rip apart the world and rebuild it in the name of Joséphine de Beauharnais; as no sacrifice was so great to prove his love. Indeed his internal revolution did bring out the best in him, and the worst. For Napoleon the lover and Napoleon the revolutionary were the same man unlike Sydney Carton and Charles Danay; and it is this distinction that would change the structure of France into a manifestation of Napoleon's heart. In fact Napoleon began his rise to a revolutionary in an eerie similarity to the book by fleeing mainland France in 1793, then spending ten days in 1794 under house arrest. It's during this time Napoleon would write Le Souper de Beaucaire. It was also during this time we begin to see a new Napoleon rise from the ashes of war, and conflict. Injured in a successful attempt to purge the city of British troops from Toulan, Napoleon had discovered a secret to winning war. Rather than play a game of a series of chance coincidences, outmaneuvering the opposing troops- he would simply destroy them. A deathly game of chess had been turned into a concept whereby the infliction of mass casualty and damage to infrastructure proved success. Heroes are not born heroes, they are made heroes by reluctance, and such I believe is the case with (young) Napoleon. Exemplified in the war with Vendee, Napoleon was brilliant enough to avoid unfavorable postings or situations which might have killed less clever men. He spent his time writing romance and seemed almost distracted of the revolution by beautiful women such as Desiree Clary. His reluctance and often insubordination became unavoidable fate as he soon realized he had been fired as a general. On the verge of no job, and no money, the question became love or war? Napoleon Bonaparte's hand may have been forced by war but it would be love that would revolutionize the future leader of France. A woman named Joséphine de Beauharnais during this time would cause him to break off an engagement with Desiree and subsequently lead him to prove his manhood in a series of battles from Italy to Egypt. Each time Bonaparte used improvised military tactics that were innovative and deceptive. He was an intellectual strategist, one capable of breaking complicated military puzzles thus leading to victory. It was however his heart, and his love for Josephine that proved to be the war he could not win. Though head over heels in love with her, and for all his successes and triumphs, Josephine would lovelessly commit an adulterous affair with Hypolyte Charles in 1796. This was Napoleon's kairotic moment. The moment when it all changed. In a maddening rage, Napoleon so infuriated, and so broken hearted; that he alas, shed of himself of his own humanity and became a machine of destruction. A hero turned villain. Napoleon the revolutionary was now fully realized. But it was far from over. 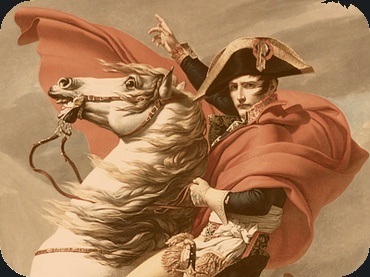 Napoleon would escape exile and return to confront the army that was sent to intercept him. It has been recorded that he walked up to them. I imagine his arms out like a sacrificial lamb, head bowed and then at the last moment like a crazed mad man he lifts his gaze upon the troops and challenges to them saying "Here I am. Kill your Emperor, if you wish." For 100 days Napoleon returned to power as the rest of Europe joined together in plans to remove Napoleon once and for all. At the battle of Waterloo in modern day Belgium, a now broken and damaged Napoleon was narrowly defeated by coalition forces comprising of the many of the European countries Napoleon had waged war on. It was his war on these countries that led them to join together and defeat Napoleon. Napoleon was exiled for good, and King Louis XVIII was placed in power. Many would attempt to forget Napoleon's crimes against humanity and paint him as a romantic hero. While there was the romantic hero Napoleon, there also was the the ruthless and bloody villain Napoleon too. We could argue that there were glimpses of the old Napoleon as he emancipated the Jews, created bodies of law and government under Napoleonic code that parallels our governments today; but, unfortunately in the end it would be Napoleon who would have to be sacrificed himself to save France and the world. The end of Napoleon's rule, much as the death of Dickens's Carton at the guillotine would prove to be the ultimate revolutionizing action of their lives. Though he envisioned a unified Europe, it would be only by the “death” of his reign that we would see the end of the French Revolution, and a more unified Europe. If not for the suffering of his own heart by Joséphine de Beauharnais- France and Europe may not have been transformed by the suffering imposed by Napoleon. A revolution inspired by pain. Pain inflicted by a revolutionary that in the end healed the heart of Europe. No translation is needed. His final mortal word, screaming into the vast, empty, darkness of death was her name: Joséphine.